Is is perhaps inconceivable today, in a world of dictates and PC correctness, that a brand was created that owed its origins to the inventor of a devastating weapon that would both change the course of history ( and come of age) during the Great War of 1914-18 - The Maxim Gun. Hiram Maxim was an American born British inventor who perfected his new weapon in 1884 in a workshop in Hatton Garden, London ( at a spot marked today by a blue plaque ) which went on to become The Maxim Gun Company. The business was financed by Albert Vickers, the son of steel tycoon Edward Vickers, who seeing the weapons potential drew the company into the Vickers fold in 1912 - for the gun then to re-emerge as the infamous Vickers Machine Gun. It later became a potent contributor, and immortal symbol, of the slaughter and devastation that was to follow on the Western Front. 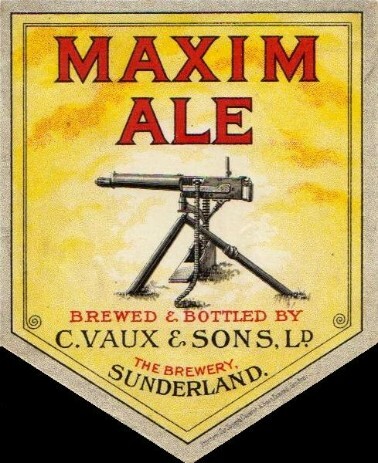 The origins of the brand, Vaux's Maxim Ale, harks back though to an earlier conflict, the Second Boar War of 1899 -1902 and was produced in recognition of the exploits of a member of the brewing family - Major Ernest Vaux. 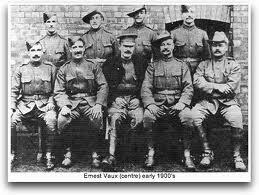 Having enlisted with the Imperial Yeomanary Major Vaux commanded part of the Northumberland Hussars, operating in the Transvaal, Orange River and Cape colonies. His bravery was acknowledged, being Mentioned in Despatches, and was awarded the Queens South African Medal along with the Distinguished Service Order in 1901. On the return of his Maxim Detachment to Britain the family decided to mark the occasion with a beer in his honour . Back in the days of 'Empire' there were no such qualms to 'correctness' and Maxim Ale was duly born! Although starting life purely as Maxim Ale, in July 1938 the strength was increased to warrant the 'Double' Maxim status as it is known today. The Vaux brewery itself, which was founded in 1837 by Cuthbert Vaux, was purchased by Wards Brewing Company in 1972 and later closed (along with Wards) in 1999. In 2000 the brand was resurrected, as two former Directors of Vaux established the Double Maxim Beer Company purchasing the rights to both the beer recipes and brand names. So what of the beer today ? There is little on the front label to suggest its historical roots bar its name, but a potted history on the back tells of its origin. The beer is considered to be a classic example of the North Eastern brown ale style, stronger (at 4.7% alc/vol) than the style brewed in the South (typified by Mann's) with an amber hue combined with smoothness of palate and relatively low hop rate. In terms of flavour the beer ticks all the boxes, but perhaps sticks to rigidly to the established style, compromising on character, and lacking an assertiveness of identity. Given its fascinating historical roots, and relative uniqueness in British brewing history, the beer deserves greater recognition - and Major Vaux, along with the men of his detachment, I am sure would agree! With particular thanks to Keith Osborne.